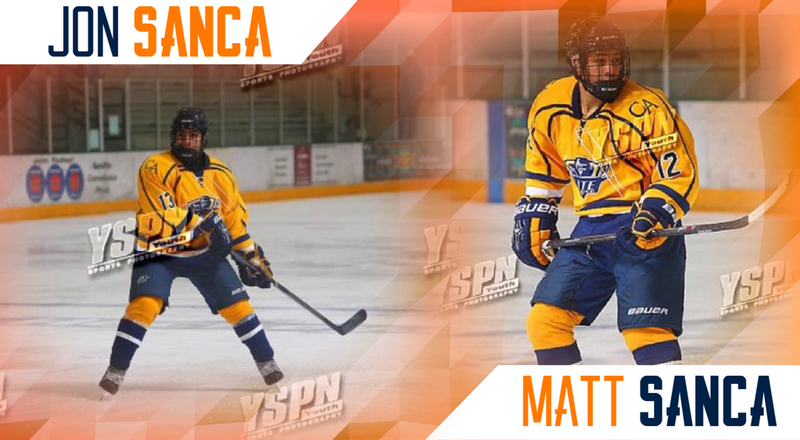 Join us in welcoming our newest additions to the Miner roster, twin brothers Jon and Matt Sanca. Originally from Connecticut, the Sanca brothers also call El Paso home where they played for El Paso's first high school hockey team, the Coronado T-Birds. When asked about the twin duo, Coach Herman responded "It's great to have Matt and Jon back on the ice in El Paso. They were a huge part of the success of our high school program. They have matured and improved as players since then. They have a lot of similar traits, but at the same time have their own uniqueness as hockey players. They both have great speed, offensive awareness, and play with a chip on their shoulder. Matt is a natural forward that has a knack for finding the back of the net. Jon is a very offensive minded defenseman that can also play forward. Even though they are coming in as freshmen, they will be heavily relied on to during the season to accomplish the goals the team has set." I chose UTEP because of the multiple programs that are offered, the diverse culture in the University and the beautiful campus, And on top of it all I get to play hockey. Playing for the hockey team and starting my classes. What has been the favorite moment of your hockey career so far? It was when we won the state championship playing for Coronado. I started playing when I was eight years old. Mats Zuccarello from the New York Rangers and Tory Krug from the Boston Bruins. I chose UTEP because it is a place where I can play the game I love and still pursue a degree. I'm looking forward to the environment that comes with attending and playing for UTEP Hockey. My favorite moment was winning the EHF championship back in Bantam Major with the Minute Men Flames. I started skating when I was about five years old and started playing hockey at the age of seven. I like to model my game after Boston Bruin Brad Marchand. My favorite activity outside of Hockey is playing Golf. Catch the Sanca brothers in action this year and purchase your season tickets now! Click here for more info.